the incredible dating power of a guitar case ... ? Last I checked Christopher Nolan's films have habitually ended with self-deluded men coming to terrible fates they bring upon themselves. James Harleman's Cinemagogue features a piece by Gareth Evans on damned protagonists in the films of Sam Raimi. Let's not forget that to pick a highly non-random example the end of Nolan's film The Dark Knight gives us a Batman who failed to save his childhood friend Rachel, barely managed to capture the Joker a second time after the Joker had coaxed district attorney Harvey Dent into going on a vengeance-fueled killing spree that gets covered up by Commissioner Gordon to create a peace based on a lie. What if today's society does not believe in a Fall and so does not assent that there is a tragedy of descent, only a tragedy of discovering that as bad as this is, this is all there is? Normally I consider what Trueman writes to be thoughtful and helpful but as someone who's kept at least some moderate tabs on story-telling I wonder if tragedy is as low-profile as Trueman may sincerely think it is. Perhaps we can observe, however, that if a society has fallen so far under and within what Francis Schaeffer might have called the line of despair that Americans distrust both political parties there may yet be room for tragedy. But it is something I can agree with that distraction or entertainment seems to be what defines the lives of many people. Story can be the real opiate of many people. There's more that could be said about that but not for this blog post. Scott Thomas and Ray Ortlund Gospel Coalition connection? Well, we'll have to wait and see. It's possible. When Ray Ortlund wrote the following blog post about the scoffer he mentioned that nobody with a claim to being hurt, however wounded, has the right to disrupt the blood-bought peace of a church. See below. Sometimes people overreach in this way because they claim they have been hurt. But no one, however wounded, has the right to disrupt the blood-bought peace of a church. The sacred wounds of Christ overrule all others. Moreover, in today’s climate of victimization, hurt can, in fact, be hate. Elders are responsible to discern this and confront it, even if the person offending is a long-standing member and a personal friend. Whether or not this is the same Scott Thomas who headed up the EIT at Mars Hill in 2007 cannot be established but the username "Scott Thomas" agreed with Ortlund's sentiment. May we, as elders, courageously lead our board meetings, staff meetings, elder meetings and private meetings with this spirit. You have rightly said, “No one, however wounded, has the right to disrupt the blood-bought peace of a church. The sacred wounds of Christ overrule all others.” If we feel the need to take up the offense and hurt of anyone, it should be of Christ. Thank you for your insight with its anchor on the Gospel. So if a Scott Thomas ends up as an elder or in ministry in some capacity at Ortlund's church the anonymous commenter may have spotted an actual connection. At the moment, of course, we can't really know. Normally Wenatchee does not bother to demonstrate even the basic plausibility of comments from anonymous people but in this case a possible Ray Ortlund/Scott Thomas connection might actually be possible to go by published comments at Ortlund's post linked above. For those curious about the role Scott Thomas played in MH history feel free to follow tagged posts in the governance and real estate and Mars Hill series. Did you hear the one about the preacher who told a joke? It must be a slow news week. Recently, I flew to the great nation of Texas to preach at a Catalyst event. I saw a rock-climbing wall, a dude break-dancing (I did not know that was still a thing, so that was good to learn), and apparently I got in trouble for making a burger out of a sacred cow. Cue recycling material where Driscoll explains that he's just doing what's in the Bible and implicitly stating he's never made fun of people who didn't have it coming. This might be because like a comedian who hits the road without having developed new material Driscoll may be hoping people don't realize how recycled the shtick is at the moment. Luke was actually new stuff for Driscoll. Esther, too. Ephesians is stuff he preached through more than a decade ago and the theme of identity is hardly new. Wendy Alsup published a study on identity in Ephesians a few years back and Bill Clem's book is called what? Identity. Of course neither Alsup nor Clem are in ministry at Mars Hill and it's so much bigger now that who cares that Driscoll's themes on a book he preached through more than a decade ago look kinda derivative of ideas presented by other people who served in ministry at Mars Hill? Driscoll's recycling bona fides should, by now, be considered above reproach, though. About the only new thing in the spiel is Driscoll referencing himself as a gigachurch rather than a megachurch pastor. And let's rest assured that it's a slow news week because Driscoll joked so. There couldn't be anything going on with any ministries started by one of Driscoll's buddies now, could there? Nope. Nothing going on at all. Well ... except ... maybe ... this thing going on with a lawsuit against Sovereign Grace Ministries (that was helmed by Driscoll's friend C. J. Mahaney) anywhere this week. Oops ... wait for it. What was this published yesterday during the so-called slow news week? Nothing going on with the Internal Revenue Service, either. Yep, it's more Linkathon than original content these days at Wenatchee The Hatchet. There's only so much mental energy to be taken up sometimes and this is a low energy period. Still, it's handy to at least share something. On the wonder of egg-freezing as a way a working woman can have it all. Not everyone considers it a panacea for middle-aged motherhood, obviously. It appears that in western Washington you can have your pot or you can cut your carbon footprint but you ain't doing both. Books tend to seem more potent and prophetic when they pre-emptively manage to distil the flaws of a decade. Orthocuban writes about the harm that words and name-calling can do and how in a relational setting it can be a type of murder. This is not merely a “spiritual” statement that is designed to point us to how holy God is. No, this is a real-life statement of the results of our engaging in name-calling toward others, particularly those others who are a regular part of our life, such as our brothers. The name-calling that takes place over the years is truly a type of murder. It is a slow and insidious murder that begins to destroy the psyche of the person to whom the words are addressed. The result is that we never get to “see” the person whom someone might could have become. We “see” only the damaged and diminished psyche of the person who is now an adult. As Orthocuban puts it, broken bones mend but the memory of insults and curt remarks fester long after a physical wound would heal. There's a bunch of stuff on a couple of back burners but time will tell how soon the stuff gets posted. Regular readers already probably have a mental checklist of stuff that's overdue. Wenatchee is willing to endorse the idea that Killian and Hansen can be seen as symbolic of Tony Stark's egotism (Aldrich) and apathy/laziness (Maya). If you haven't seen the film by now consider what you just read a spoiler. As has been noted at Wenatchee The Hatchet in the past, Scott Thomas was once an executive elder at Mars Hill and President of Acts 29. Then in the course of 2012, after Joyful Exiles was published, Scott Thomas transitioned into other work. It eventually came to pass that Scott Thomas and Derrin Thomas both ended up with jobs at The Journey. Well ... now Scott and Derrin Thomas are not listed quite so prominently in the staff with Ministry Development these days. To go by publicly presented profiles now it's just Katie Wachter. Why are you at The Journey? Nothing is more exciting to me than seeing God move in and through his people. And, because of my role at The Journey, I get a front row seat to watch as God radically moves not only in our church, but also in our partnering churches and networks. Given my propensity to not spend money, I love all the free activities our city offers. There's nothing greater than gathering a group of friends to picnic and attend Shakespeare in the Park, movie on Art Hill, Whitaker Music Festival, etc. Given how complementarian Acts 29 churches are reported to be it is at least a little peculiar that The Journey has only a woman listed as the Ministry Development Project Manager. Wouldn't a complementarian church have some men in authority over her within the department? That might have been Scott Thomas and/or Derrin Thomas in the past, but who's able to confirm such a thing now? It looks like it can't be Derrin Thomas these days because he's now Events Manager at Acts 29 Network. Ministry development department. Completed various research projects, writing, analysis, and editing. Oversaw building projects, including coordinating with contractors. Derrin Thomas stopped being Executive Assistant in Ministry Development at The Journey in March 2013. So whomever is in male authority over Katie Wachter wouldn't be Derrin. So is Scott Thomas still Pastor of Ministry Development at The Journey? Scott Thomas isn't mentioning The Journey quite as prominently in his Twitter profile these days. Apparently still there. Although it is worth noting that not all men who served as pastors at Mars Hill have necessarily kept up their profiles on LinkedIn and in some cases a wide variety of roles get collapsed into a single role. Like this guy, Jamie Munson, who, to go by his own description of his work at Mars Hill was Executive Pastor from 1999 to 2011. But by Mark Driscoll's own account (as in second optional entry from the top left, today) it was Driscoll himself who was legal president up until some time in 2007. Streaming audio here. So when, exactly, was Jamie Munson president of Mars Hill any time in 2006? Or 2001? Given how obviously "The Man" seemed to be circumcised of a certain "woodchipper" anecdote, don't be too certain that Driscoll's commentary from February 2008 about how you really can't do ministry with your friends to have completely survived redaction. But, who knows, perhaps it's all still there in tact. All that is to simply note that if Scott Thomas is still Pastor of Ministry Development at The Journey then, for whatever reason, the people at The Journey have not seen fit to advertise that role all that prominently in their on-line presence lately. Excited to be installed as a pastor at @Sojourn this evening. Humbled to serve with the elders and members of this church. House's name will likely not be familiar to most people. 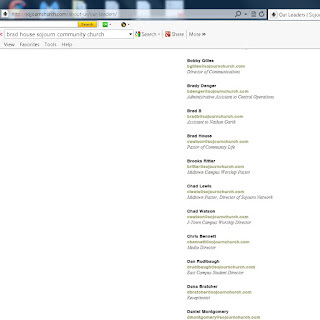 Brad House was part of a committee with Pastor Phil Smidt and James Noriega. All the above is previously posted content. 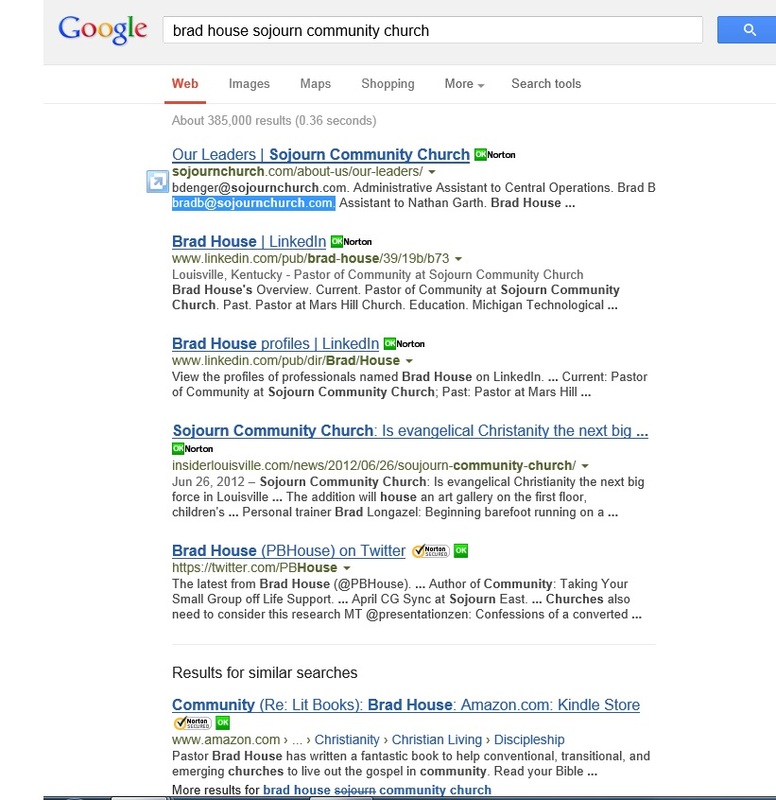 Kind of looks like cwatson@sojournchurch.com is the email listed as the contact email for Brad House, doesn't it? 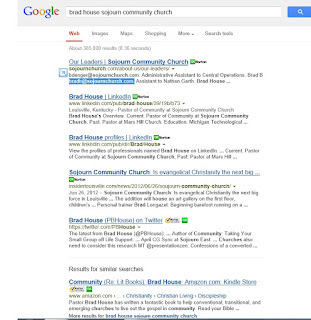 The Google search results pull up what appeared, at one point, to be House's contact email but it's not listed at the actual site, at least not today. Well, we can see from House's LinkedIn profile that he's listed as Pastor of Community at Sojourn Community Church and that he was a pastor at Mars Hill Church from 2005 to 2012. For some reason Sojourn Community Church is mentioning that he's on their team but not mentioning, at the moment, how to contact House directly. For that matter House isn't making too big a point of being a pastor at Sojourn Community Church in his own Twitter profile these days. 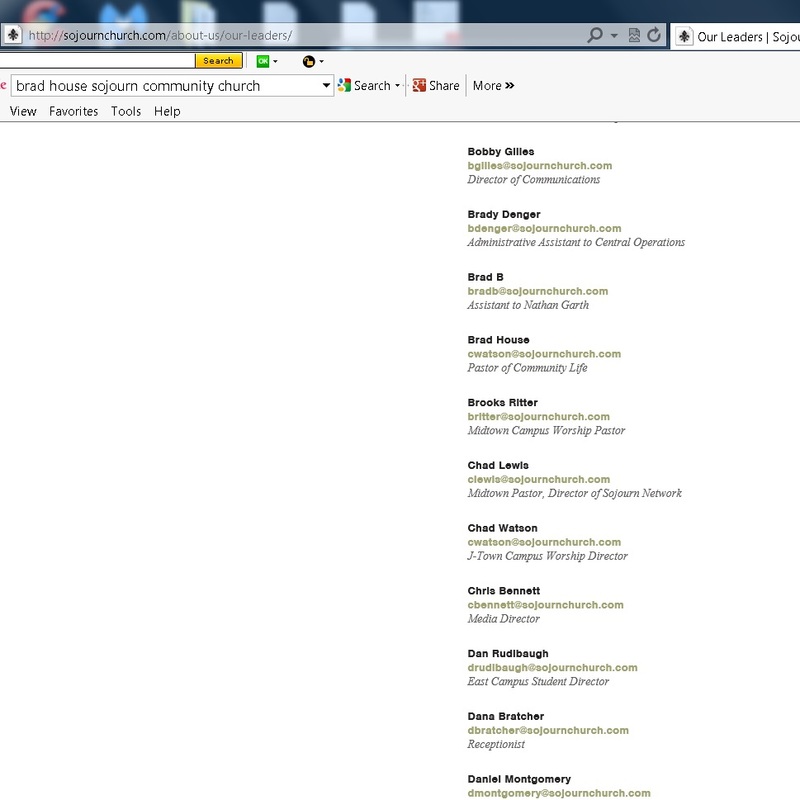 For reference on House tweeting the official shift from Mars Hill to Sojourn, see here.